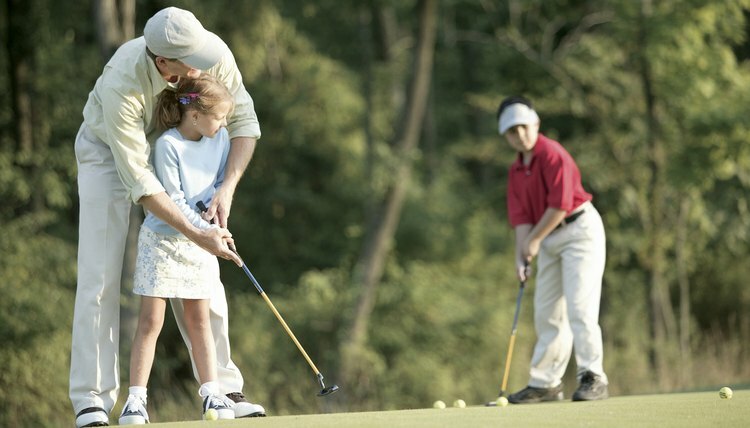 Teaching children how to play golf is much different than teaching adults. Teaching kids how to golf requires a different approach than when teaching adults. First and foremost, it has to be fun or you will lose their interest. Incorporate games into their practice. Do not use technical terms--kids respond better to visual cues and words they understand. Be sure not to overload a kid with too much information during a lesson--focus on one or two key things. Most important, be encouraging when they struggle and enthusiastic when they succeed. Teaching kids how to putt is a good place to start. Besides the fact that putting is the most crucial aspect to scoring well in golf, it is also the simplest stroke. Kids can usually perform a basic putting stroke and strike the ball. Start by having them make very short putts of two to three feet; this will build their confidence as they see they can do it. Once you have completed the short putts move, move to longer uses. Using thin string or chalk, make a circle around the cup, about a 3-foot radius. Make another larger circle around the first circle, a radius of about 5 feet. Make the kids' goal to hit a putt inside these circles; assign point values for each circle and a point value for making the putt. This is encouraging, because they are not likely to make too many putts, but they will be rewarded for coming close. Leave the circles from Step 2 around the cup and move off the green to start chipping. Show them a basic chip-shot stroke--it should not vary too greatly from the putting stroke. Let them try to chip the ball into the circles. It is fine if they don't get the ball airborne and roll the ball there--that's expected. Again, make a game out of it. Widen the circles if necessary in order to help score some points. If this is a lesson, stop at this point. Chipping and putting is a good introduction. When you start teaching the full swing, be sure show them the proper grip and setup. Allow the child to grip the club however is naturally comfortable (usually a 10-finger/baseball grip), but make sure the hand position is correct. Also make sure of the setup: Feet shoulder width apart and knees slightly bent are the keys. These are the fundamentals you do not want to ignore. For the actual swing, allow kids to swing freely with whatever comes naturally. Kids will usually start with a huge swing. If they miss the ball, have them take half swings to promote contact and confidence. Some visual cues to help them: making a big "U" with the clubhead or sweeping the ball off of the tee. Tee up all the balls during the first couple of lessons. The only thing to watch as far as correcting form is movement of the feet. Kids tend to step all around while swinging. Not only does it make hitting the ball much more difficult, it's a terrible habit.